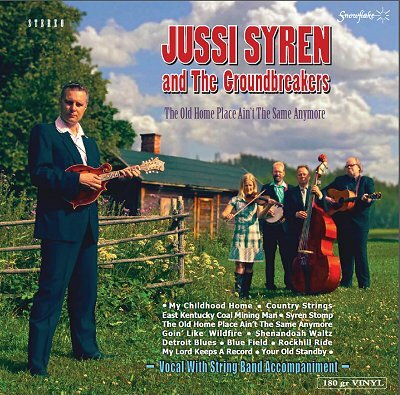 Thanks to bandleader Jussi Syren of Finland for the news that The old home place ain't the same anymore, the eighth and latest album by Jussi Syren & the Groundbreakers (first mentioned on the EBB on 5 October), has now been released on Snowflake Records and is getting plenty of rotation in the USA by leading bluegrass DJs such as Dennis Jones, Charlie Hall, Bob Mitchell, and Gracie Muldoon. The project is exceptional in many ways. It was recorded in a two-day session, 100% live with no overdubs, it will be released in 180 gr vinyl LP + CD format, and it is all analog. This method brings forth the true bluegrass drive the group deliver in their live shows. It is a fresh breath of air in the world of slick and over-produced bluegrass music. The uncompromising bluegrass sound of the Groundbreakers was born years ago in loud honky-tonks and smoky bar rooms. This kind of environment needs a 'close to the bridge – close to the mike' attitude. This sound doesn´t develop in college campuses or concert halls. Half of the material is written by Syren, such as hard-driving 'East Kentucky coal mining man' and a bouncy instrumental, 'Syren Stomp'. The Groundbreakers make good renditions of Stonewall Jackson´s 'Blue field' and Ted Lundy´s 'My childhood home'. On this project fiddler Nelli Ikola joined the group permanently. She guested on the Shave and haircut album in 2011. The core of the group – mandolin-playing lead singer Jussi Syren, guitarist J.P. Putkonen, banjo player Tauri Oksala, and bassist Kari Hella – has stayed together for thirteen years, and it can be heard on this album. Jussi Syren & the Groundbreakers are looking for venues to perform in Europe in spring 2013. They can be contacted through the band's website, Facebook, or e-mail.